The Grant gold dollars and silver half dollars were issued on behalf of the Ulysses S. Grant Centenary Memorial Association, and that entity selected Laura Gardin Fraser to prepare the designs. A notice appeared in the January 24, 1922 issue of The Cincinnati Enquirer: There will be minted 10,000 $1 gold pieces and 250,000 silver half dollars, the first to sell for $2.50 each and the second for $1 each. This fund will assure the tri-fold purposes of the association which is interested in the construction of a memorial highway from this city to the east along the Ohio River. 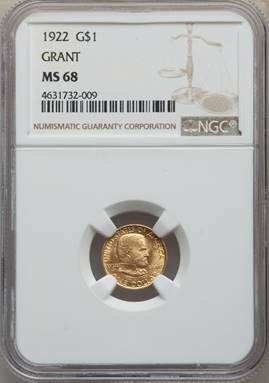 After the minting the dies will be destroyed, thus giving the coins a high numismatic value.” NGC has graded just 9 pieces at this level, 2 of which are designated as NGC Star examples. 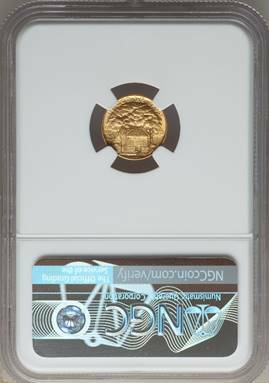 Listed at $19,400 in the CDN CPG and $32,500 in the NGC price guide.